Estate planning can be challenging. 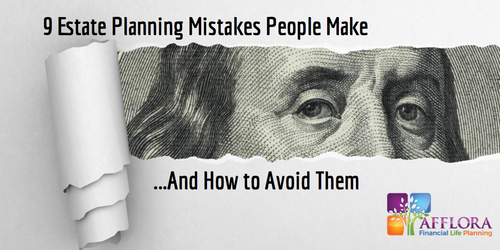 Make sure you avoid these nine big mistakes that many people make! 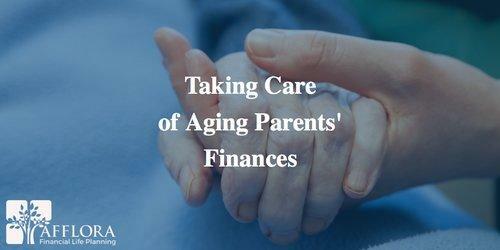 Caring for your parents as they age includes helping them take care of their finances. There’s no right way to go through this transition, but waiting too long and doing nothing simply increases the chances that the people you love might fall into a financial tailspin they can’t recover from. Investment Advisory Services offered through Cambridge Investment Research Advisors, Inc., a Registered Investment Advisor. Cambridge and Afflora Financial Life Planning, LLC are not affiliated. This communication is strictly intended for individuals residing in the states of KS, MO, AZ, FL, WA, IA, CA, IL, OK, NC, ID where Desmond Henry is registered as an investment advisor representative. All written content and opinions expressed on this site is for educational and general informational purposes only and are not intended to provide specific advice or recommendations for any individual. No information on this site should not take the place of consulting with a financial, tax, or legal professional. Content is believed to be from reliable sources and no representations are made by our firm as to another parties’ informational accuracy or completeness. Outside website links being provided are strictly as a courtesy. Accessing these websites, you are leaving ours and assume full responsibility and risk for your use of the websites. We make no representation as to the completeness or accuracy of information provided at these websites. Nor are we liable for any direct or indirect technical or system issues or any consequences arising out of your access to or your use of third-party technologies, websites, information, and programs made available through this website. Check out the background of firms and investment professionals at FINRA BrokerCheck and the SEC Investment Adviser Public Disclosure website. Cambridge Investment Research Advisors, Inc. and Afflora Financial Life Planning, LLC does not provide legal or tax advice.